Download "1 Fostering Statement of Purpose"
6 6 been received within 8 weeks. This process can take up to 8 weeks to enable CRB checks to be completed and returned. ix A qualified social worker is allocated to carry out the Form F assessment. 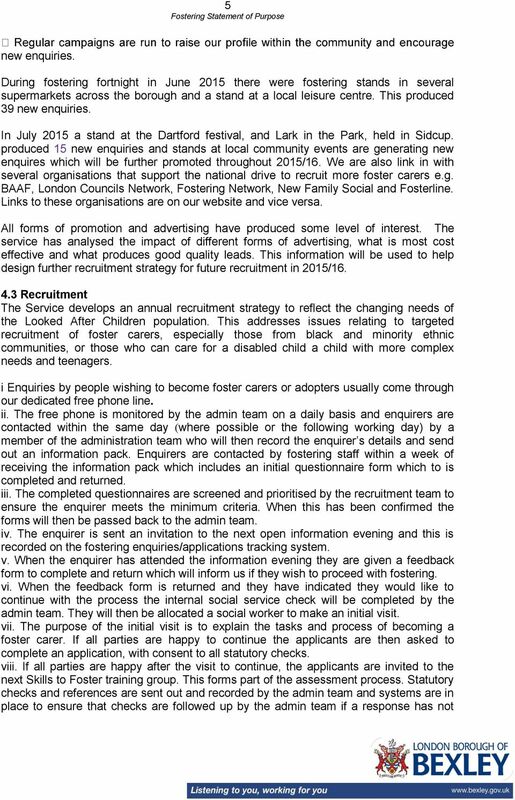 4.4 Assessment, Supervision, Training and Review of Foster Carers The Children s Placements Service is responsible for undertaking assessments of prospective foster carer applicants. Foster carer placements vary in length and complexity, and can be for an overnight stay while the parent is hospitalised, to caring for a child where they have been removed for their own safety with an assessment being undertaken on their future care. The Service provides preparation training through the Fostering Network Skills to Foster course to all applicants prior to undergoing an assessment, to give applicants further information and to complement the assessment process. After successful completion of the training course and Stage 1 assessment (including the collection of a range of checks and references) applicants may progress to Stage 2 of the assessment process. The service aims to complete Stage 2 assessments within 3-5 months. Once an applicant has been assessed, their case is presented to the Fostering Panel. Connected Persons fostering assessments are also presented to the Fostering Panel. On approval, carers are given an information pack, a Good Practice Guide and sign an Agency Placement Agreement. 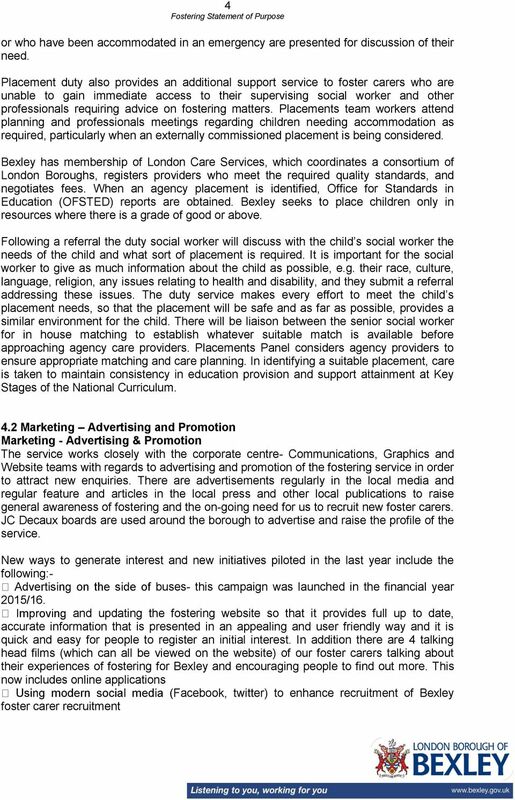 The Panel makes a recommendation to the Agency Decision Maker (Director, Children s Social Care) as to the suitability to foster and the approval status. 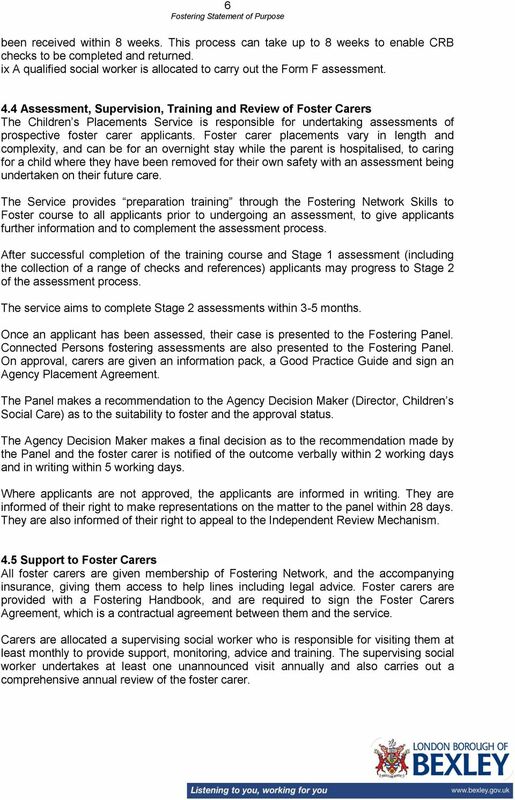 The Agency Decision Maker makes a final decision as to the recommendation made by the Panel and the foster carer is notified of the outcome verbally within 2 working days and in writing within 5 working days. Where applicants are not approved, the applicants are informed in writing. They are informed of their right to make representations on the matter to the panel within 28 days. They are also informed of their right to appeal to the Independent Review Mechanism. 4.5 Support to Foster Carers All foster carers are given membership of Fostering Network, and the accompanying insurance, giving them access to help lines including legal advice. Foster carers are provided with a Fostering Handbook, and are required to sign the Foster Carers Agreement, which is a contractual agreement between them and the service. Carers are allocated a supervising social worker who is responsible for visiting them at least monthly to provide support, monitoring, advice and training. The supervising social worker undertakes at least one unannounced visit annually and also carries out a comprehensive annual review of the foster carer. 7 7 Supervising social workers attend Placement Planning meetings, and will attend Child Care Reviews, Child Protection Case conferences and any other relevant professional meetings. Emergency Out of Hours social work support is provided through the Department's Emergency Duty Team. All foster carers receive a core allowance to meet the needs of the child. Foster carers who meet the criteria of being approved to care for any child will receive a reward element. Carers are also able to claim for additional expenses, for example car mileage exceeding the standard allowance. Carers available for emergency out of hours placements receive a separate payment for this. All foster carers receive equipment required to care for the child or young person, including a bed, bedding and safety equipment. The virtual school are responsible for the allocation of computers to help support and encourage Bexley s Looked After Children in their educational achievement. Savings of 5.40 per week (2014/15 figure) are taken at source from the fostering allowance and retained and saved by the local authority for the looked after child until the child is discharged from care. There is one support group for foster carers held each month. 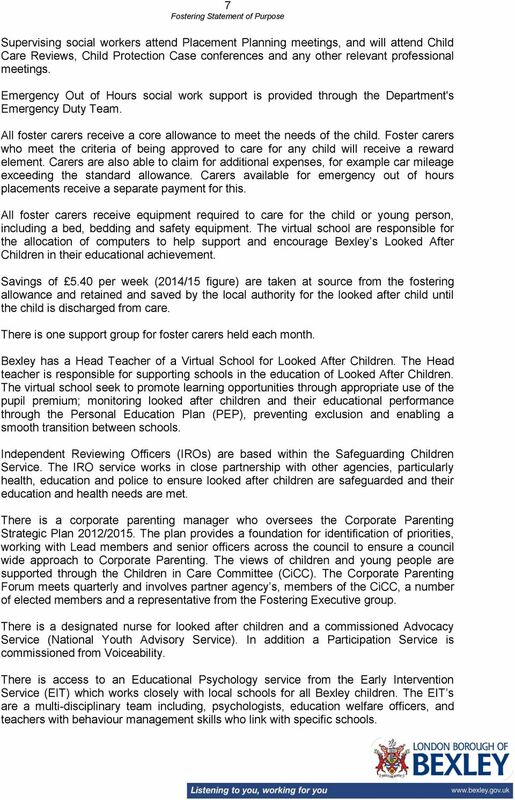 Bexley has a Head Teacher of a Virtual School for Looked After Children. The Head teacher is responsible for supporting schools in the education of Looked After Children. The virtual school seek to promote learning opportunities through appropriate use of the pupil premium; monitoring looked after children and their educational performance through the Personal Education Plan (PEP), preventing exclusion and enabling a smooth transition between schools. Independent Reviewing Officers (IROs) are based within the Safeguarding Children Service. The IRO service works in close partnership with other agencies, particularly health, education and police to ensure looked after children are safeguarded and their education and health needs are met. There is a corporate parenting manager who oversees the Corporate Parenting Strategic Plan 2012/2015. The plan provides a foundation for identification of priorities, working with Lead members and senior officers across the council to ensure a council wide approach to Corporate Parenting. The views of children and young people are supported through the Children in Care Committee (CiCC). The Corporate Parenting Forum meets quarterly and involves partner agency s, members of the CiCC, a number of elected members and a representative from the Fostering Executive group. There is a designated nurse for looked after children and a commissioned Advocacy Service (National Youth Advisory Service). In addition a Participation Service is commissioned from Voiceability. There is access to an Educational Psychology service from the Early Intervention Service (EIT) which works closely with local schools for all Bexley children. The EIT s are a multi-disciplinary team including, psychologists, education welfare officers, and teachers with behaviour management skills who link with specific schools. 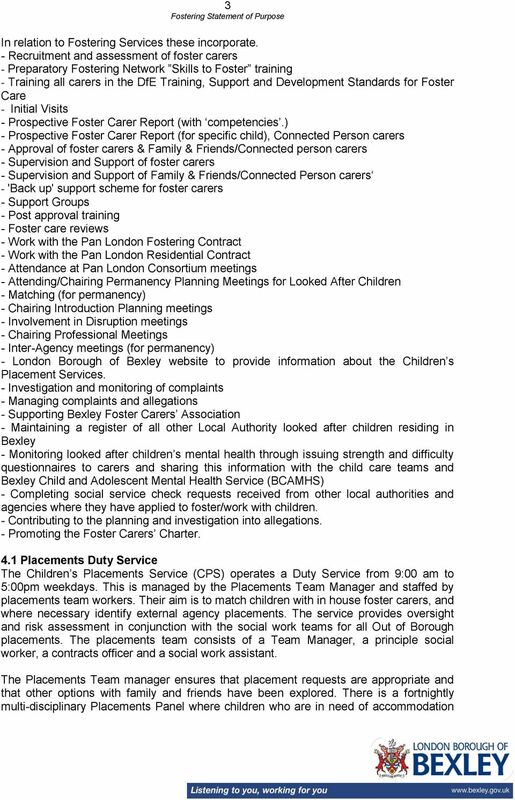 8 8 All foster carers are able to contact a social worker within the Bexley Children and Adolescent Mental Health Service (CAMHS) who will provide advice and support and see the carer and/or children, if appropriate. CAMHS has provided training to foster carers, for example on Non Violent Resistance, and provides consultation on request, if the referral meets their eligibility criteria. Where it has been appropriate the Children s Placements Service will fund foster carers to be supported by a consultant from Fostering Network. Following approval, all foster carers are subject to a six month probationary period, which culminates with the first review and thereafter, reviews are held annually. A foster carer has a comprehensive review of their approval each year, or more frequently if there has been a significant event, which may have had an impact on the foster carer s ability to foster. It is the responsibility of the supervising social worker to prepare this report with the foster carer. There is an annual robust training programme in place, in line with the National Minimum Standards and the Children s Workforce Development Council standards for foster carers, to ensure all foster carers receive continued professional development. It is expected that carers will complete a minimum of 3 training courses per year and undertake identified mandatory training courses. Training sessions are held on a rolling programme at a variety of times to suit all circumstances. Online training is also available. 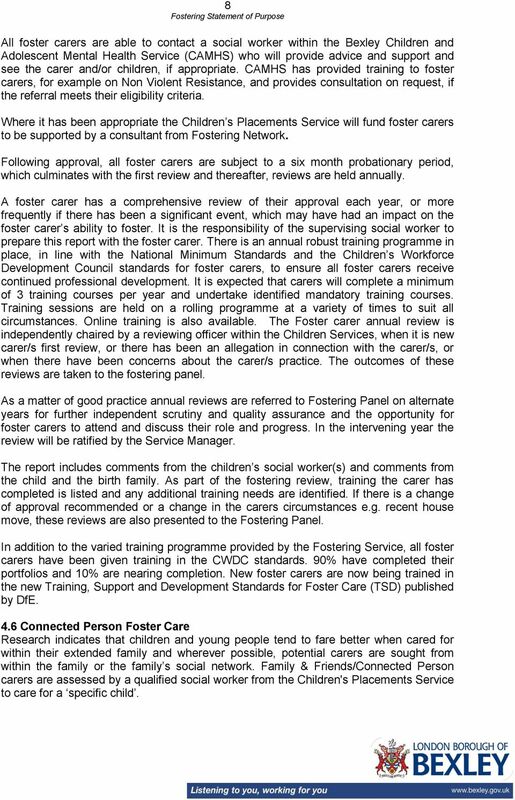 The Foster carer annual review is independently chaired by a reviewing officer within the Children Services, when it is new carer/s first review, or there has been an allegation in connection with the carer/s, or when there have been concerns about the carer/s practice. The outcomes of these reviews are taken to the fostering panel. As a matter of good practice annual reviews are referred to Fostering Panel on alternate years for further independent scrutiny and quality assurance and the opportunity for foster carers to attend and discuss their role and progress. In the intervening year the review will be ratified by the Service Manager. 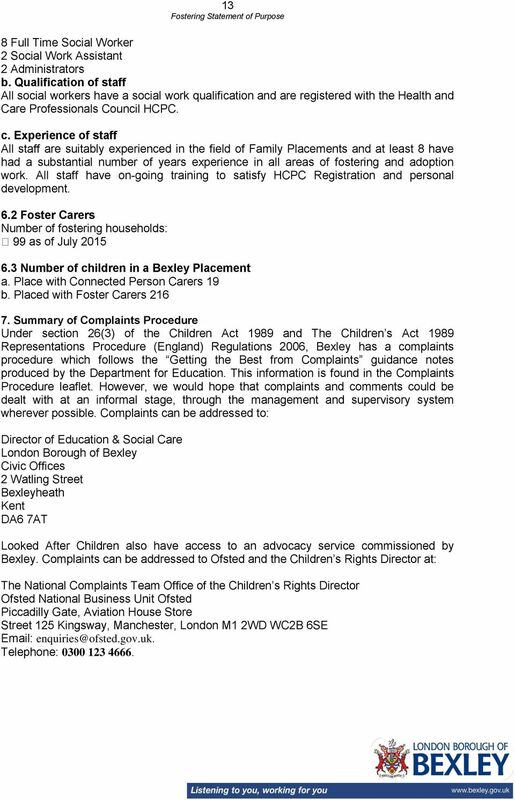 The report includes comments from the children s social worker(s) and comments from the child and the birth family. 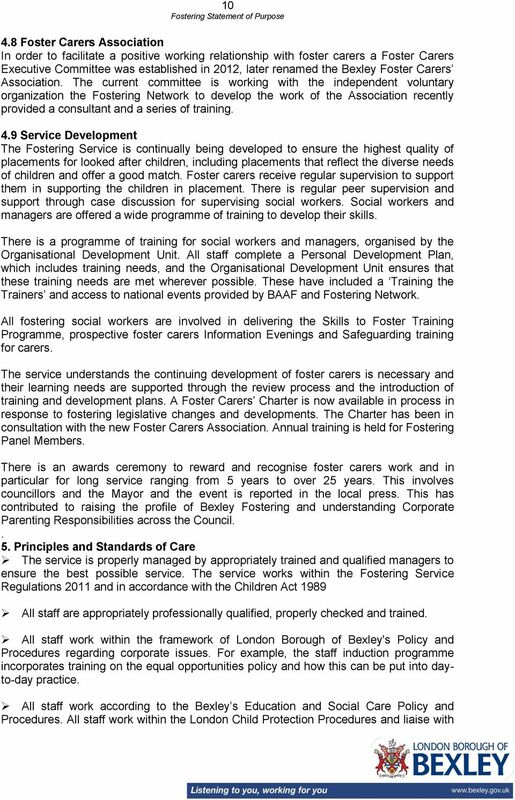 As part of the fostering review, training the carer has completed is listed and any additional training needs are identified. If there is a change of approval recommended or a change in the carers circumstances e.g. recent house move, these reviews are also presented to the Fostering Panel. 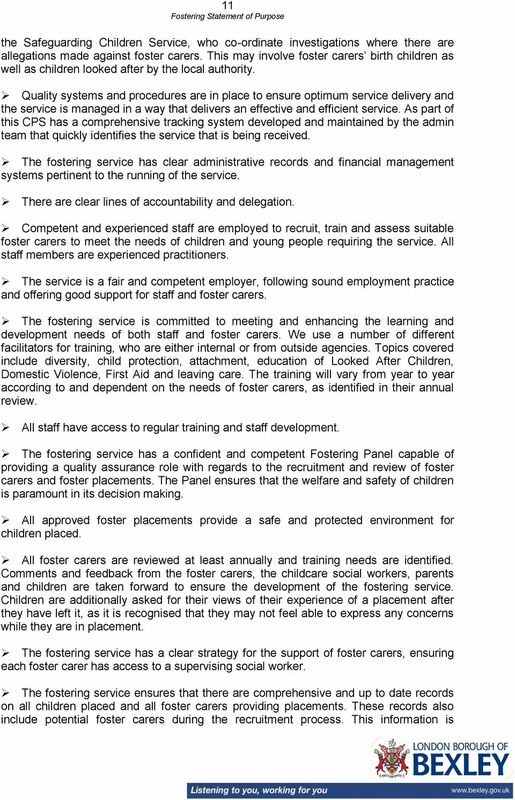 In addition to the varied training programme provided by the Fostering Service, all foster carers have been given training in the CWDC standards. 90% have completed their portfolios and 10% are nearing completion. New foster carers are now being trained in the new Training, Support and Development Standards for Foster Care (TSD) published by DfE. 4.6 Connected Person Foster Care Research indicates that children and young people tend to fare better when cared for within their extended family and wherever possible, potential carers are sought from within the family or the family s social network. Family & Friends/Connected Person carers are assessed by a qualified social worker from the Children's Placements Service to care for a specific child. 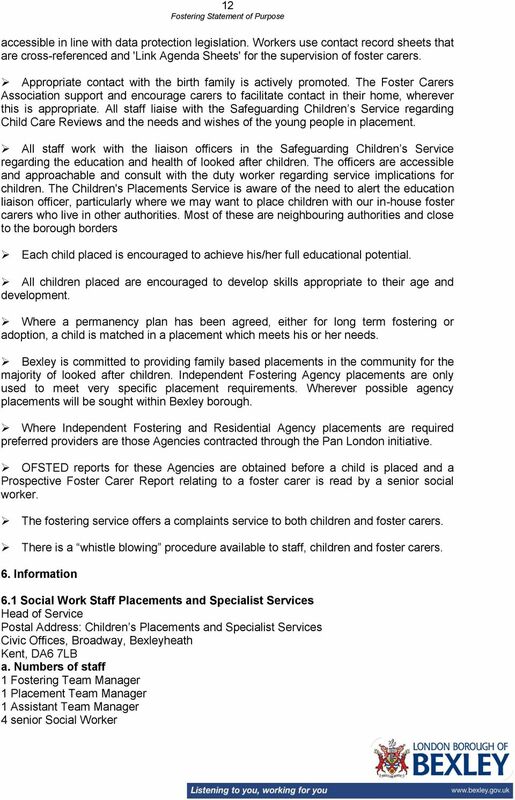 9 9 The Connected Person foster carer is allocated a supervising social worker. Connected Person carers receive the same core allowance to meet the needs of the child as other foster carers. Connected Person Foster carers are invited to the two support groups held each month and have access to the full fostering training programme. 4.7 Short Break Family Based Shared Care The Fostering Service works closely with the Disabled Children Service to provide carers for disabled children and young people whose families require occasional short breaks. The placements for children who access the Disabilities Children s Service (DCS) are stable and all of the families have packages of care to support the children and their carers. External providers have been commissioned to run short breaks programmes, including Saturday Clubs, After School and Youth Clubs, care at home and in the community, holiday schemes and outings. The DCS are encouraging increasing use of direct payments for families to purchase short breaks directly from a provider, employing a support worker or other services to support the caring for child who has disabilities. 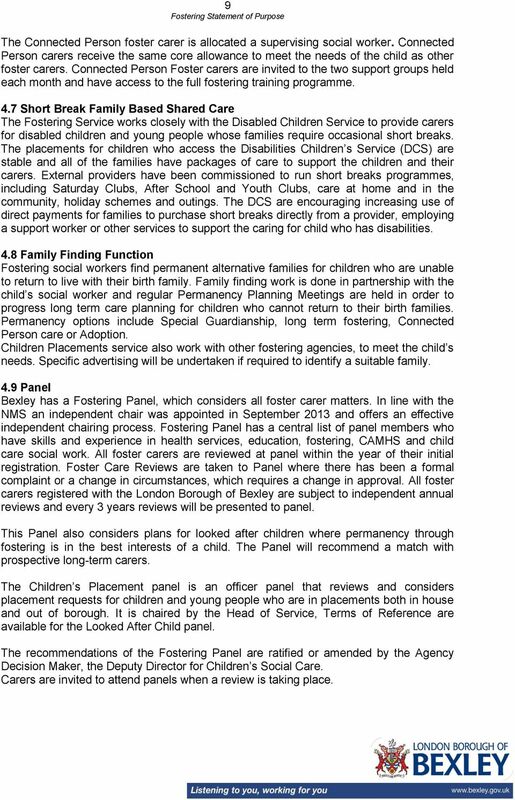 4.8 Family Finding Function Fostering social workers find permanent alternative families for children who are unable to return to live with their birth family. Family finding work is done in partnership with the child s social worker and regular Permanency Planning Meetings are held in order to progress long term care planning for children who cannot return to their birth families. Permanency options include Special Guardianship, long term fostering, Connected Person care or Adoption. Children Placements service also work with other fostering agencies, to meet the child s needs. Specific advertising will be undertaken if required to identify a suitable family. 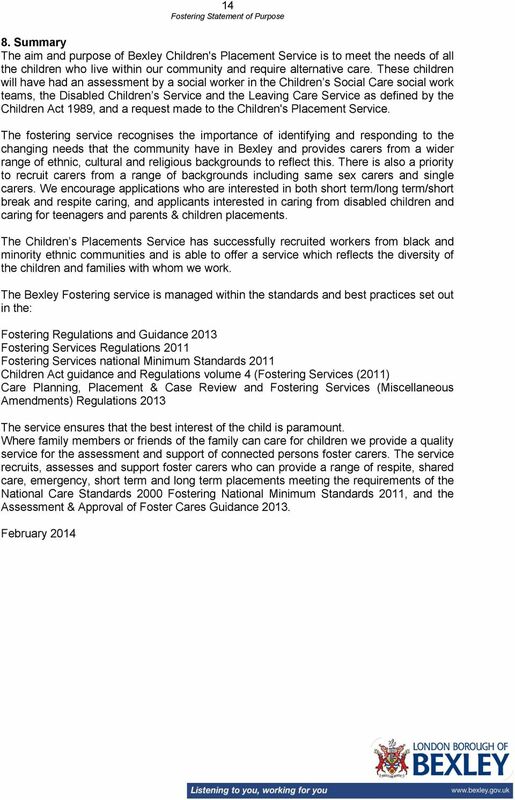 4.9 Panel Bexley has a Fostering Panel, which considers all foster carer matters. In line with the NMS an independent chair was appointed in September 2013 and offers an effective independent chairing process. Fostering Panel has a central list of panel members who have skills and experience in health services, education, fostering, CAMHS and child care social work. All foster carers are reviewed at panel within the year of their initial registration. Foster Care Reviews are taken to Panel where there has been a formal complaint or a change in circumstances, which requires a change in approval. 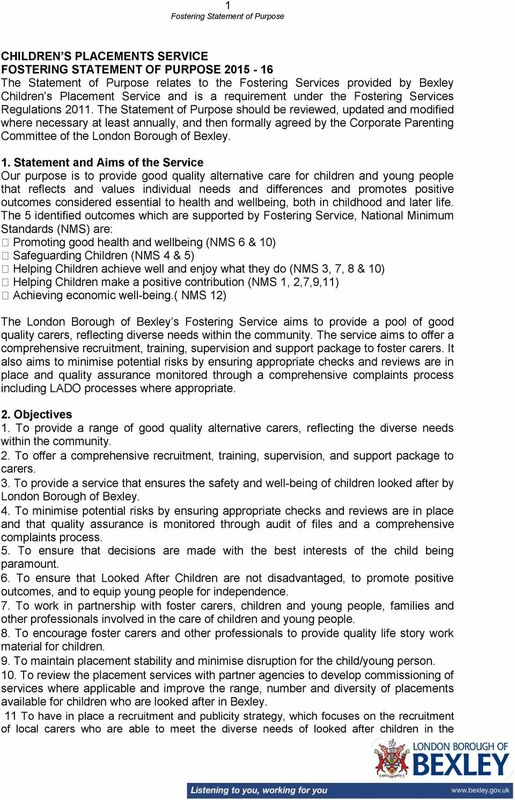 All foster carers registered with the London Borough of Bexley are subject to independent annual reviews and every 3 years reviews will be presented to panel. This Panel also considers plans for looked after children where permanency through fostering is in the best interests of a child. The Panel will recommend a match with prospective long-term carers. The Children s Placement panel is an officer panel that reviews and considers placement requests for children and young people who are in placements both in house and out of borough. 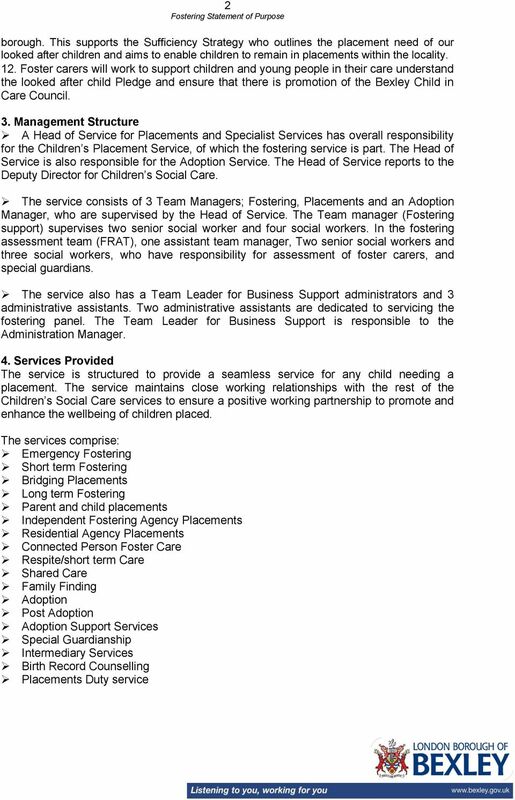 It is chaired by the Head of Service, Terms of Reference are available for the Looked After Child panel. The recommendations of the Fostering Panel are ratified or amended by the Agency Decision Maker, the Deputy Director for Children s Social Care. Carers are invited to attend panels when a review is taking place.